SRV used this amp for almost his entire career to get a crisp and overdriven guitar tone, also in the picture of his setup. Bottom right, behind Page in this image you can see this vintage Super Reverb. As posted on Instagram, Joe Bonamassa owns a collection of 1962 and 1963 era Fender amps which he recalls have a chocolate color. Among the collection is a Super Reverb Combo Amp. According to Premier Guitar, Skolnick's Super Reverb is rehoused in a Mojotone head. This is from the Johhny Cash TV show in the 1960s. He's plugged into a Super Reverb. He played these in his early career. The Fender Super Reverb is mentioned in [this interview for *Guitar.com*](http://guitar.com/articles/joe-walsh-lifes-been-good) - "That would go into a pair of Fender Super Reverbs with four 10s, except only one top. I would connect the other four 10s to the external speaker jack, so that I was using one top and eight 10s. That way I had a spare top. I would put them on metal folding chairs that are about knee-high. Standing about eight or ten feet in front of those, you can actually move around and find different areas to sustain any note you want. It's also incredible because eight 10s pull the impedance of the amp down to like 4 ohms, and that's where you really get your sweet sound -- when the amp is screaming before it blows up. My other favorite thing is a pair of [Vox AC-30s](http://equipboard.com/items/vox-ac30-guitar-combo-amp). That is tremendous for Fender guitars. The Super Reverbs are tremendous for humbucking configurations, like on the Les Paul." Again, lots spring of reverb. According to Premier Guitar, Zappa uses the Fender Super Reverb amplifier. According to Instagram post by Lightbody, he uses/used the Fender Super Reverb. In the October 2008 issue of Vintage Guitar, Steve Cropper said that "Later I moved up to a Super Reverb, and I think the mic was a Neumann U-67. That’s on all kinds of stuff, like “Soul Man.” But on “Dock Of The Bay,” I brought my old Harvard back to play the licks – which, of course, Otis never heard." In this early photo of Television Richard Lloyd and Tom Verlaine can both be seen plugged into blackface Fender Super Reverb amplifiers. While there is a slight chance they are using the unpopular and short-lived 4x10 blackface Fender Concert it is highly unlikely due to the rarity of that amp compared with the ubiquitous (and superb sounding) Super Reverb. Scott introduces his amplifier on this Rig Rundown. He identifies one of the amps as a Fender Super Reverb. "Sometimes, if I can’t get those, I’ll use a [Fender] Super Reverb or a Deluxe Reverb together—I run two amps in stereo. But Magnatone is what I'm using right now." 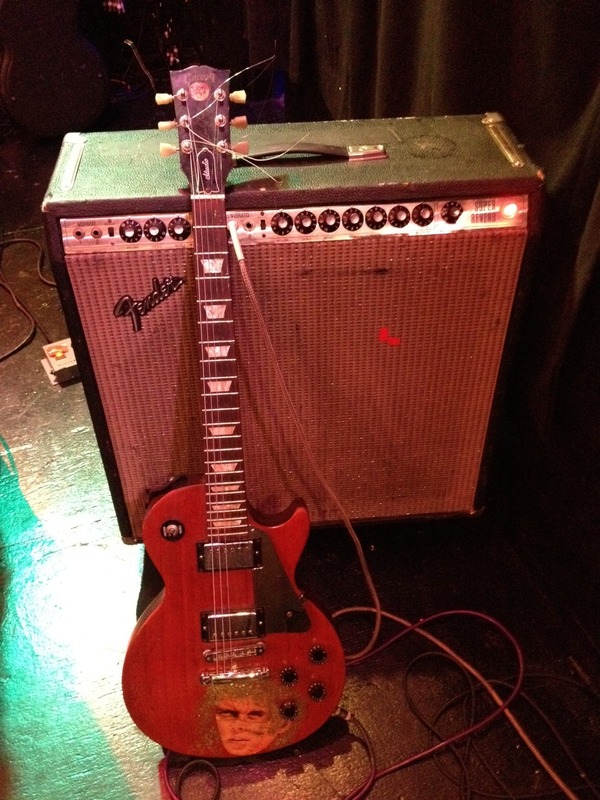 In this blog post, Matt's Gibson Les Paul is seen hooked up to a Fender Super Reverb. Ultimate amp to handle any tones. The Super Reverb is a great combination of enough power for any stage, with 4 10" speakers to give clarity of notes and picking. It can handle virtually any pedal at it's input, and has enough tone variation to dial in most tones. Speaker leeds replacement really improve the sound. My main amp, 4x10 Alnico jensen gives good tone. Works great with my pedals. Works better with strats at high volume, about 5.
ooo yes just bought a 25th Aniversary ES335 historic, yo right it sounds amazing, but on channel 2 :-) , channel 1 does not have reverb, I think you mean channel 2 . Thanks, great guitar. tomorrow first time i will gig with it.